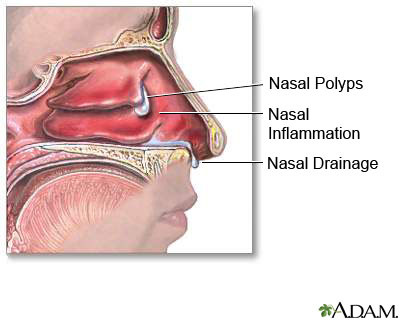 Nasal polyps are small, teardrop-shaped growths on the lining of the nasal passages or sinuses. These growths are typically benign (non-cancerous). They have a variety of causes, including allergies, viral and bacterial infections, and immune system response to fungus. Smaller nasal polyps may cause no symptoms and often go unnoticed. Larger polyps, on the other hand, can cause significant pain and discomfort, as they often obstruct the sinus cavities, impair breathing, and predispose the patient to severe, chronic sinusitis. At Los Angeles Sinus Institute, Dr. Zadeh treats most nasal polyps with medications. When medical therapies are not effective, he uses safe surgical procedures to remove larger polyps. However, along with surgery, the underlying cause must also be treated, or polyps are likely to recur. Chronic inflammation can cause the blood vessels in the lining of the nasal cavity and sinuses to become more permeable. Water accumulates in the cells, and eventually, the force of gravity causes the waterlogged tissues to develop into polyps. They may appear one at a time, or several in clusters, like grapes. Polyps are usually pearl-colored and soft, with a consistency similar to jelly. To remove larger nasal polyps, Dr. Zadeh can perform endoscopic sinus surgery. In this procedure, fiber-optics surgical techniques are used to unblock obstructions, open the natural drainage areas of the sinuses, and remove nasal polyps. Increased ventilation and drainage can relieve congestion and sinus headaches, improve nasal breathing, and enhance the patient’s sense of smell in many cases. During endoscopic sinus surgery, Dr. Zadeh uses previously-performed CT imaging and computers intra-operatively to minimize risk. This technology allows him to view live images of the procedure and, at the same time, have a real-time three-dimensional CAT scan image of the surgical area. Intra-operative CT guidance provides Dr. Zadeh with important anatomical information and gives him better insight into the field of the operation, reducing the risks and improving the results of surgery. When nasal polyps are surgically removed, they are likely to recur if the underlying source of the problem is not treated. Dr. Zadeh always tests the polyps to evaluate the underlying cause, and in the post-operative period he treats this source to help prevent polyp recurrence. Endoscopic sinus surgery to remove existing large polyps obstructing the sinuses. When you come to Los Angeles Sinus Institute for nasal polyp surgery, Dr. Zadeh can not only remove nasal polyps in a safe, CT image-guided procedure, but also diagnose and treat the underlying cause of the polyps, to assist in preventing them from recurring in the future. Dr. Zadeh believes in treating the source of the disease, not just the symptoms. He treats the whole patient, not only the disorder. If you are suffering with nasal polyps, call us to schedule an initial consultation with Dr. Zadeh.